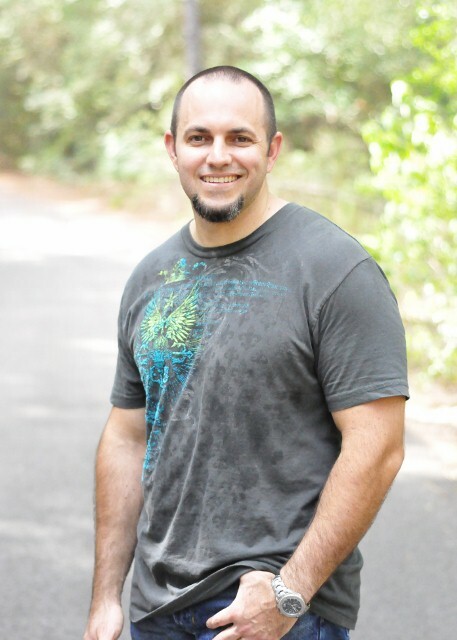 My personal trainer, Sean, of Fitness 101 sends a great newsletter out every Monday with great little nuggets on fitness, a short article and a great recipe. (This week’s recipe was for Zesty White Chicken Chili.) 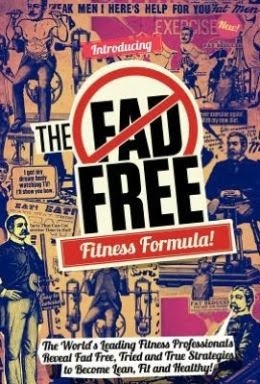 If you are interested in receiving this newsletter, you can sign up for it on his Fitness 101 Facebook page. When you sign up, you will also get access to a lot of other great articles. Go here like his Facebook page for access and then here for information about the newsletter (it is under the notes section). This post is sponsored by Fitness 101. Sean is getting tough on me. Can you believe that? KEEP GOING. It’s as if he doesn’t want me to have flabby arms or something. Unbelievable. He’ll also say things like, “Don’t worry about the number. Just keep going.” He knows if he says, “Okay, with this machine, I want you to do 3,231 reps”, I might push over an elliptical and walk out. Those ellipticals are expensive and he can’t be having that. Another nervy thing he does? He doesn’t let me stop. What kind of personal trainer does that? What kind of personal trainer wants you to lose inches, you know? But, I’m still showing up. I suppose one motivator is the lost inches that I talked about in this post here. Another motivator is that I do feel tons better when I walk out the door. Energized. Hopeful. Healthier. Those are good things. But, I still have more to go. I want to be lighter and tighter. I want to quit sneaking those butter cookies with the dot of raspberry in the middle (they jumped in my basket at the store!). I want to lay off the Diet Coke more than I do. And I want to drink more water. I know I need to drink more of it. Here are some things I didn’t know about water (thanks, WebMD!). I mean, okay, I may have known some of these things once before, but these are things that I needed to be reminded of about water. #2 You need it for your weight control: Water can help control calories. It helps to drink water instead of drinking something with calories (we know this, of course). It also helps to eat food that has a high water content, such as fruits, vegetables, broth-based soups, oatmeal and beans. (Beans have water? Get outta here!) Food with more water in it looks larger, takes longer to chew and is absorbed more slowly by the body. #3 You need it for your energy: Water helps to energize your muscles. Muscle cells need water or they will fatigue. #4 You need it for your skin: Water helps your skin. If you are dehydrated, you get all wrinkly but drinking water doesn’t get rid of all wrinkles, obviously. We aren’t balloons, people. Once the body gets enough water, it says sayonara to the excess and sees that stuff out the kidneys. See. You. Later, extra water. Here is the most important reason we should drink enough water: KIDNEY STONE PREVENTION. I have never had them, but my cousin did and she said the pain was worse than childbirth. So, we all need to drink water. I know I do. I think I was on a water strike after this one lady came to our house trying to sell us a water treatment system. She made me so mad about water. I didn’t actually talk to water for a while after that. 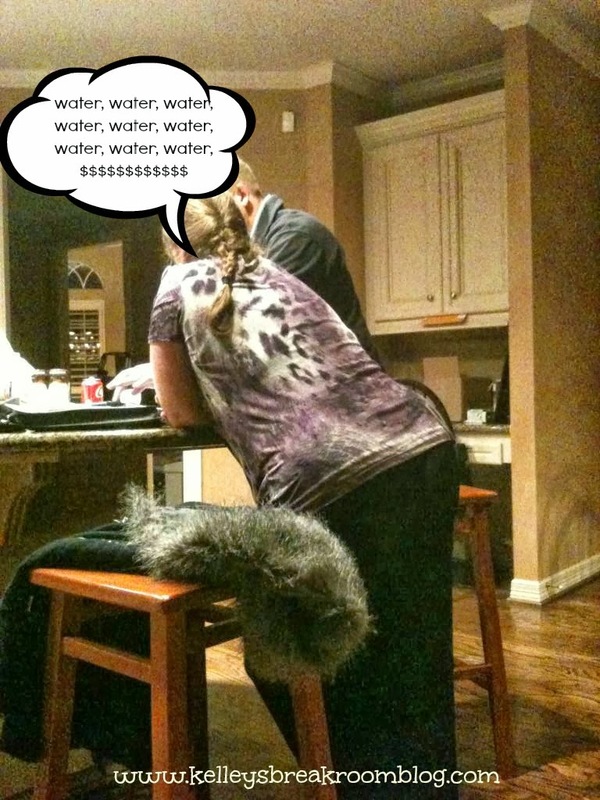 I wrote about her in my post “For the love of Honey Boo Boo, get out of my house”. Sean says that we are supposed to drink half our weight in ounces of water. So, if you weigh 500 pounds, you need to drink 250 ounces of water a day. There are usually 16.9 ounces in water bottles. So, if you are 500 pounds, you need to drink 29 1/2 bottles of water a day. I liked this little graphic I found on Pinterest from www.coachmmorris.com. There are 128 ounces in a gallon. 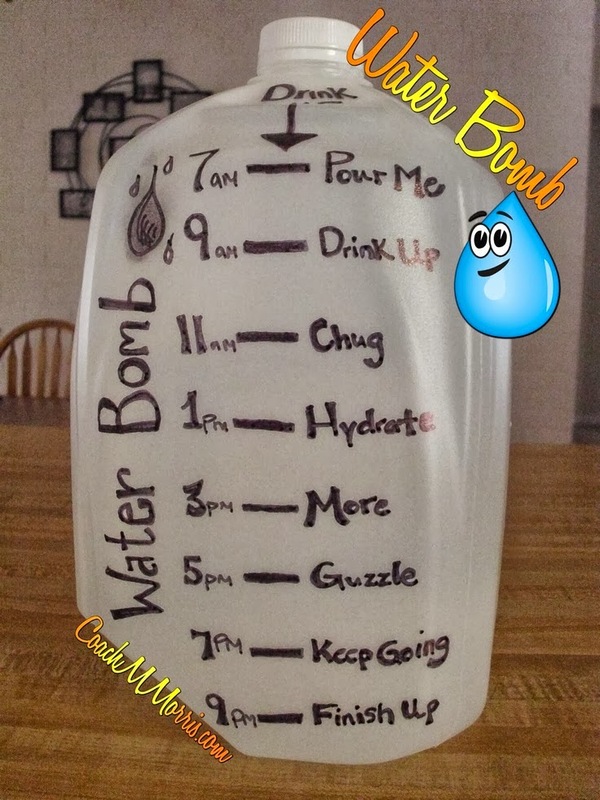 You might not need to drink a gallon of water a day, but I like the idea of marking it off and keeping yourself accountable through the day. Apparently, there are even apps to help remind yourself to drink enough water. “Waterlogged” is one of them. Can we drink more water? If you find yourself stopping with just a cup or two of water a day, do you know what you need to do next? That is definitely what Sean would say. Okay, okay, okay. Disclaimer here. 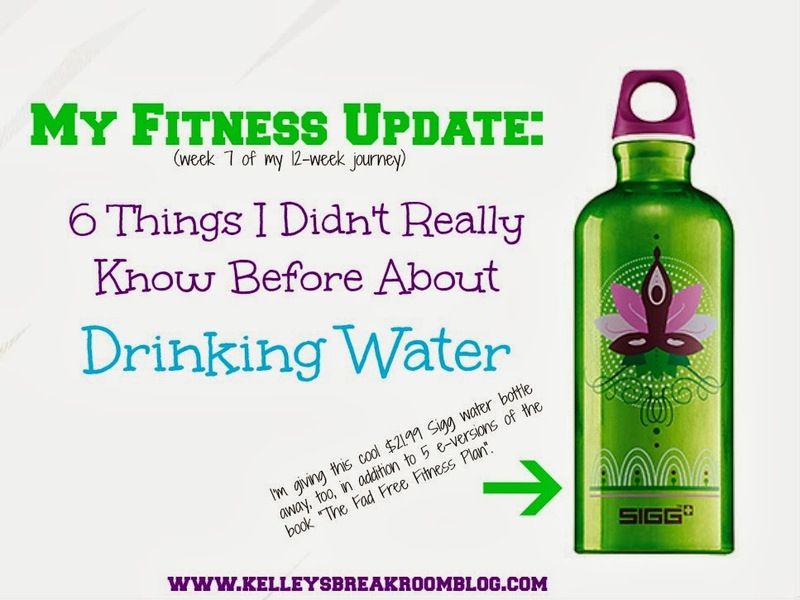 My sister read this post and said that we are really only supposed to drink water when we are thirsty or when we are working out. We aren’t supposed to be chugging it down like there is no tomorrow. She sent me this article. You can read it all and sort it out. I’m still giving that bottle away, though. Ya hear me? Please send me your address to kelleysbreakroom@gmail.com, ladies! Yay, you guys! TODAY, in the spirit of drinking more water and being more fit, I am giving one person this really cool $21.99 Sigg water bottle, plus an e-version of Sean’s book, and 5 more of you an e-version of Sean’s book up there. All you need to do is comment (so I know who wants one!) and like the Kelley’s Break Room Facebook page and the Fitness 101 Facebook page, which, if you do, you will also have access to his weekly newsletter and some really great, inspiring articles related to fitness that I mentioned above. It doesn’t necessarily have to be this one that you win. 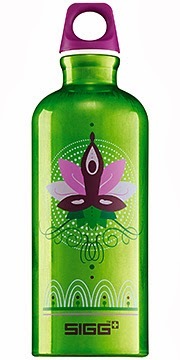 There are TONS of really cute water bottles at mysigg.com. You can pick the one that you like the best. I thought this one was so pretty!